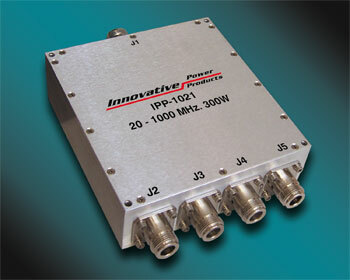 Innovative Power Products, Inc. announces the availability of their new connectorized combiner/divider Model IPP-1021. This model offers a frequency range of 20 to 1000 MHz at 300 Watts of power. This 4-Way Combiner / Divider is 5.10” x 4.10” and is offered with type “N” Female connectors on all 5 ports. The insertion loss is less than 0.75 dB, phase balance is less than +/-5 degrees and VSWR is less than 1.25:1. Isolation is greater than 15 dB. Delivery: Stock to 4 weeks. For pricing or additional information, please contact the Sales Department at 631-563-0088, or email us at sales@innovativepp.com. Innovative Power has recently added over 30 new Combiners, 90 degree Hybrid Couplers and Directional Couplers to their website. Please visit our website at www.innovativepp.com to see an up to date list of the products offered . IPP offers a full line of RF/Microwave in-phase Combiners/Dividers in various split ratios, frequencies and power levels up to multi-kilowatts. Combiners/Dividers are available in connectorized packages as well as custom drop-in configurations. IPP Combiners/Dividers offer low loss and VSWR while providing port-port isolation through the use of IPP’s high power resistive products. IPP is a designer and manufacturer for applications in the RF and Microwave industries, and offers a variety of broadband, high power couplers, combiners, RF power resistors and terminations operating up to 6 GHz. 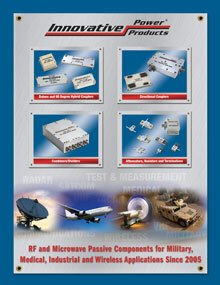 Our RF Resistors, Terminations and 90 degree Drop-in Hybrid Couplers are RoHS compliant. View our recent product announcements.